The University of Maine at Presque Isle and the Presque Isle Rotary Club are joining forces to host their Sixth Annual Purple Pinkie Project on Wednesday, Feb. 7 and, with the help of the Rotary Clubs in Caribou, Fort Fairfield, Limestone, Mars Hill and Washburn, this celebration three months in the making spreads throughout central Aroostook County and—new this year—into Canada. All activities raise awareness of Rotary International’s efforts to eradicate polio worldwide and raise money $1 at a time to go toward that global effort. As they do each year, organizers and volunteers will “paint” the region purple during the Purple Pinkie Project. 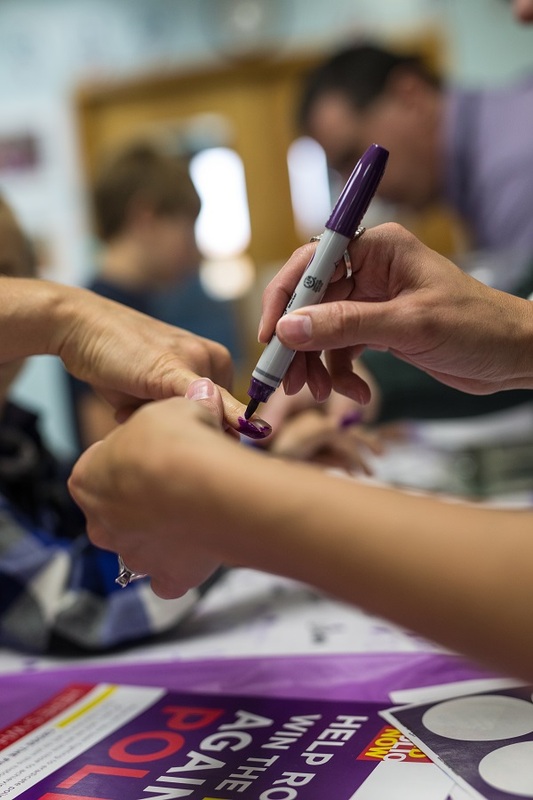 Similar to other projects that have been held by Rotary Clubs around the country, local organizers will host Purple Pinkie stations, encouraging people to donate $1 to have their pinkies marked with purple ink—the dollar goes to Rotary International’s “End Polio Now” campaign and the purple pinkie symbolizes one child’s life saved from the crippling disease. 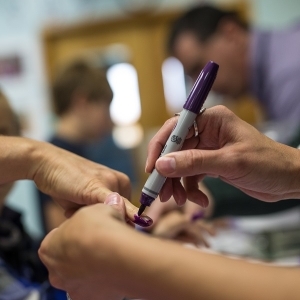 The estimated cost to immunize one child from polio is $1, and when each child gets immunized, Rotarians mark their pinkies with purple ink to prevent double dosages. The Presque Isle club normally hosts its Purple Pinkie Project during World Polio Day on Oct. 24, but when it had to shift its date to February, organizers decided to make it a longer term celebration over the course of the school year. Activities kicked off on Oct. 21 with the Fort Fairfield Rotary Club hosting a Purple Pinkie table during its 2017 Cash Draw event. On Oct. 28, the Washburn Rotary Club hosted a Purple Pinkie Table during its Hunters Breakfast. On Nov. 6, the Limestone Rotary Club partnered with the Maine School of Science and Mathematics to host a Purple Pinkie Station of their own. An exciting new addition to the celebration—and one that took the event international—was the Woodstock Rotary Club in New Brunswick, which held Purple Pinkie Project events at two Woodstock schools in late October and early November. At UMPI, in the Center for Innovative Learning (formerly the Library), from 8 a.m.-4:30 p.m.
At NMCC, in the Akeley Student Center, from 11 a.m.-1 p.m. UMPI and NMCC Education students will staff this table. At TAMC, at the A.R. Gould cafeteria, from 11 a.m.-1 p.m. Members of UMPI’s BioMedical Club will staff this table. At UMPI’s Houlton Higher Education Center, at the front desk, from 8 a.m.-1 p.m.
Also on Feb. 7, Presque Isle Rotarians will be on hand to host Purple Pinkie stations at Easton Elementary School, Easton Junior-Senior High School, Mapleton Elementary School, Pine Street Elementary School, Presque Isle High School, Presque Isle Middle School, and Zippel Elementary School. A Purple Pinkie station will also be set up for employees at MMG Insurance (staffed by UMPI Business Club members). In addition, the Caribou Rotary Club will continue with its drive to support awareness of polio eradication efforts year round with club fundraising at each club meeting, and the Mars Hill Rotary Club will visit Fort Street Elementary School and Central Aroostook Junior/Senior High School in Mars Hill later this spring. This year’s World Polio Day activities carry on a tradition of raising many local dollars for, and even more awareness about, Rotary International’s efforts to eradicate polio. The first annual World Polio Day and Purple Pinkie Project event, held in October 2012, saw an estimated 1,000 people in the community participate and initially raised $1,250. An anonymous donation of $1,000, however, pushed the fundraising total to well above $2,000. Last year’s event raised a record $4,400 and saw an even greater number of community members participate. Polio has not been a problem in the U.S. for many years, but this is not the case in several developing countries. In 1985, Rotary International began raising funds in an effort to eliminate polio worldwide. By partnering with the World Health Organization and other government and private groups, Rotary International has achieved a 99 percent reduction of polio worldwide. However, there are still three countries that have not been declared polio-free—Afghanistan, Nigeria, and Pakistan. To completely wipe out polio, Rotary International is raising funds and mobilizing volunteers to bring immunization projects to these areas. This year’s event is co-presented by UMPI and the Rotary Clubs of Central Aroostook, and is sponsored by TAMC, NMCC, and MMG Insurance. For more information, contact UMPI’s Community and Media Relations Office at 768-9452 or visit www.umpi.edu/worldpolioday.